The death of her husband forced Garnet Wheelock to become a mail-order bride. The torturous ship voyage was eclipsed only by the cruelty of her master in the New World of Virginia. But the Lord's hand was upon her, and she has been bought by a new master and given a home. A widower of four years, Samuel Walsh longs for a women's touch upon his home and family. The Widow Wheelock seems perfect for the task - she's industrious and loving, and the children adore her. He's vowed never to marry again, but when news of her pregnancy spawns accusations of impropriety, Sam weds Garnet to preserve his honor. Could their feelings run deeper than mere obligation? Can the Lord weave two broken lives together and create a future stronger than the past that haunts them? 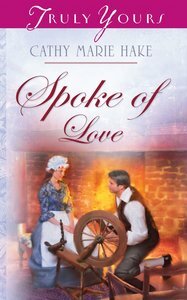 About "Spoke of Love (#712 in Heartsong Series)"
Cathy Marie Hake is a registered nurse who worked for many years in an oncology unit before shifting her focus to perinatal care. The author of over twenty novels including Serendipity;That Certain Spark; Whirlwind; and Forevermore, she lives with her husband and two children in Anaheim, California. Visit Cathy's Web site at www.cathymariehake.com.